As an eCommerce business with a smart website, the last thing you want is for potential customers to walk away empty handed (or carted) from your product pages. They look great, you think – so why the lack of conversions? In this article, I’ll take you through the process of Conversion Rate Optimisation (CRO) and why it’s so important for eCommerce. We’ll then explore the key features of a high-converting website. 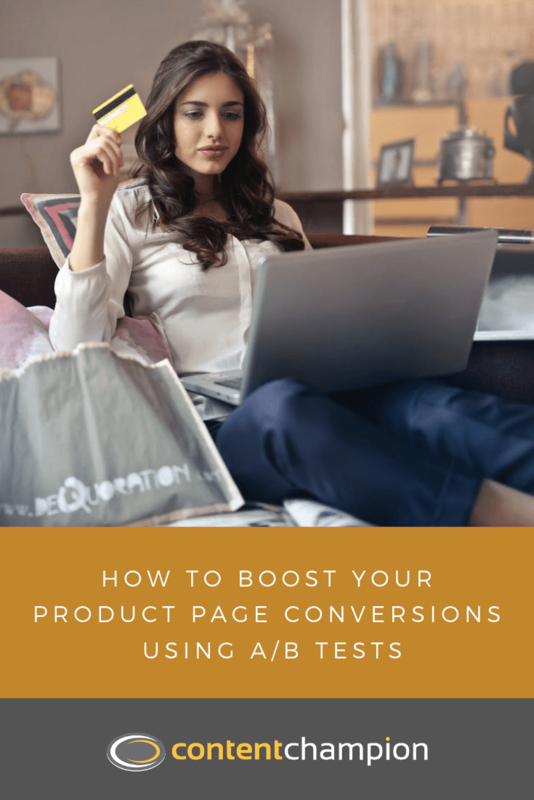 Finally, we’ll focus on one particular method of CRO – A/B testing – and how you can use it to boost conversions on your website. Basic A/B testing: What to test, and how? Advanced A/B testing: What else can you test with more specialist tools? So, you’ve spent much of your marketing budget on SEO and visitors are flocking to your website – what now? Well, if you give them a website that inspires them to purchase they’ll likely keep coming back for more. They might even tell their friends – and soon your sales will rise. However, if those visitors arrive at your product pages to find them slow, confusing, or unattractive, there’s a good chance they’ll leave and never return. That’s all your SEO investment wasted. A highly optimised website will help reduce your customer acquisition costs by making the most of the traffic that’s already landing on your website: encouraging prospects to convert, increasing their average spend, and improving the potential for repeat custom. For those that don’t convert immediately, you also need to work on an eCommerce lead generation strategy. It’s important to remember that there is no one-size-fits-all approach to CRO. Optimal operating across devices: It’s a stark fact that mobile-commerce conversion rates are only about half those on the traditional desktop. What are you doing to optimise your site for mobile users? Page load speed: Make sure your visitors don’t get bored waiting for the web page to load – if they do, they’re up to 79% less likely to buy from you again. Images and videos: Beautiful images and informative videos can make all the difference to your visitors’ experience. CTAs: Clear call-to-action buttons with the right message, and in the right place on the page, will make it easy for the user to act on their purchase decision. Headlines and language: Punchy headlines and thoughtful text will create the right impression of your business. User-generated content: If you get great reviews of your products from previous customers – and you display those reviews on your web page – it can have a hugely positive impact on conversion. With so many website features, how can you know where to begin optimisation? In the next sections we’ll discuss how to identify and address the aspects of your website that are impacting your conversion rate the most. There are a number of ways to test how users are responding to your website, allowing you to fix the problem areas that are restricting your conversion rate. Below I explore some popular CRO approaches, before focusing on one in particular: A/B testing. Surveys: Convince your customers to complete a survey about their experience and you could be looking at some valuable insights. Two free survey tools are SurveyMonkey and Survey Nerds. Checking content readability: Review your web content for readability and check it’s not preventing prospects from converting. Try this free readability tool. Multivariate testing: Test out several different versions of your website against each other at the same time, to see which combination of factors increases conversions the most. Read this Optimizely Blog post to see how multivariate testing earned $60 million for the Obama campaign. So, for example, you could show your original website video (version A) to half your website traffic and a new video (version B) to the other half. If more prospects go on to convert after watching video A, then keeping video A seems the best choice for your website. But, of course, it’s not quite that simple. Read on for the best practices to follow when carrying out A/B testing for your eCommerce site. For further ideas of what features to A/B test, try reading this list or this list. Analyse web metrics: How is your website currently performing – what are its strengths and weaknesses? Google Analytics can help you here. Formulate a hypothesis: Based on your research, what do you think is preventing conversions? Is it unclear CTAs or a confusing payment form, for example? Design the experiment: Create a variation of your website, working on your hypothesis, which can be tested against the existing version. Decide how long the test should be and at what time it should be run, based on your website traffic (VWO provides a free calculator for this). You might also want to perform the test for specific segments to increase its accuracy. Gather and analyse data: Run the test for the set time and then analyse the results. If the variation achieves more conversions that’s the winner, and you can deploy it on the site. Alternatively, if the test is inconclusive, decide what you can learn from it and keep testing. A/B testing is fundamentally an iterative process that should be regularly repeated if you want a highly optimised website. Don’t give up if the first couple of tests aren’t successful. For a free, accessible, and user-friendly tool to conduct A/B testing, try Google Optimise. Unbounce: For $79 p/m Unbounce allows you to create high-quality landing pages and conduct A/B tests. There are many other players in this niche, and you can weigh up the pros and cons. You might also want to look into Elementor as an overarching website design tool. Optimizely: For $49 pay-as-you-go, the Optimizely platform provides extensive features that permit detailed A/B testing. AB Tasty: This CRO platform supports all forms of testing, including A/B, multivariate, and funnel tests. AB Tasty will provide a custom quote on request. With these tools and services you should be able to test your users’ experience extensively, resulting in a highly optimised website and increased conversions. For eCommerce businesses, conversions are inextricably linked to the customer’s website experience. A/B testing is a useful tool to discern which variation of a website feature is preferred by customers, thus driving increased conversions. As a process, A/B testing must be well-planned and executed, based on thorough web metrics analysis and thoughtful hypotheses. It must also be an iterative process – with regular, repeated testing. Finally, effective A/B testing is part of a wider CRO and marketing strategy. It is one essential component of the engine that drives a successful eCommerce business.